Part one of this discussion introduces my thoughts on why only whole spices should grace your pantry and part two features the beginning of my essential spice list. 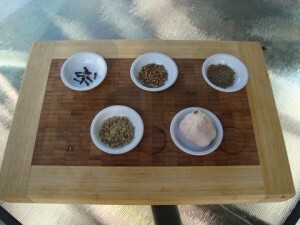 Part three is a continuation of the Kitchen Playground essential spice list. While we use a lot of fresh coriander at the Kitchen Playground. We possibly use even more coriander seeds. It is a critical component to every curry blend or paste that I make. They are also used extensively in Spanish, MIddle Eastern, Indian, South American and Asian dishes, meaty dishes in particular. Next to garlic, this is possibly my most used spice. It is used extensively in Mexican, Asian, Indian, Spanish and Middle Eastern food. It is a component of every spice mix and curry powder I can think of. I use it in most of my my pickling endeavours. In fact I usually grind almost a small spice jar full at a time as I know it will be used within the week. Not used in my kitchen as much as cumin or coriander seeds but still a staple. Fabulous with most fish dishes and vital in many spice mixes and curry pastes. Also used in baking, especially bread. I didn’t intend this series to include spice mixes but as most pantries with dried spice collections seem to have a little jar of this one, I thought I better include a simple recipe for the real deal. You’ll never go back. Slowly dry roast in a pan (or give it about five minutes at 100 degrees on slow speed in the thermomix). When the spice are all nicely darkened, allow them to cool enough to remove the cardamon seeds from the pods. Grind all together in a mortar and pestle or theromix into as fine a powder as possible. Store in an airtight container in a cool dark place. This will keep up to three months but is better the sooner it is used. This one is just plain obvious. Isn’t it? Nearly everything savoury is made better with garlic. Which is not as big an overstatement as it first appears. The only other thing I have to say on the topic is that I only buy garlic that has traces of purple in the skin. I don’t like my food to be bleached. Yuk.